Found one file extension association related to RankTracker and 1 file format developed specifically for use with RankTracker. 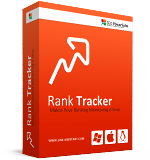 RankTracker is a popular SEO tool for monitoring and analysis of Google rank tracking. Saves you a lot of time monitoring your Google and Yahoo! rankings. Lets you continuously monitor your ranking trends for all your keywords. Checks your rankings for an unlimited number of sites, very fast. Shows if your site moved up or down in search results. Supports 257 international and local search engines. Runs seamlessly on Windows, Linux and Mac OS X. If you need more information please contact the developers of RankTracker (Link-Assistant.com), or check out their product website.